Barbers Facial Moisturiser contains the original Tamanu Oil and is the last step in your daily skin care routine, beside the aftershave splash. Prevent dry skin and can be used several times a day when your skin is extreme dry. Special developed to support the skin from sun damage. Facial Moisturiser is the final step in proper care for your skin. Prevent and treat dry skin, protect sensitive skin, improve skin tone, texture and gives your skin a healthy, smooth, blemish-free appearance. Perfect after shaving. 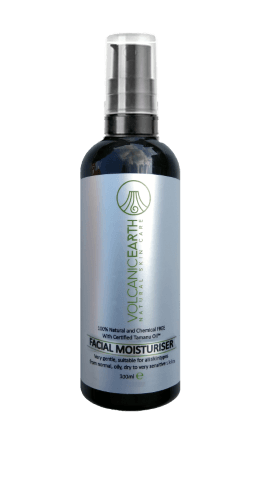 Volcanic Earth Barbers Facial Moisturiser is specially developed to support the skin from sun damage. A good Facial Moisturiser should soothe and moisturise your skin. You want to keep your complexion hydrated and supple. If you work in an air-conditioned office or outdoors in the cold or wind, this will tend to dry out your skin. Moisturising renders your skin more resilient to skin damage caused by wind and cold weather. If you work outdoors in the sun, we recommend using a moisturiser with SPF. In fact, a study conducted in Nambour, Qld, Australia in 2013 found that the daily use of an SPF slowed the aging process by 24 percent when compared to the intermittent use of an SPF! Aging is a process that occurs over time and the signs of aging can appear more obvious at different stages as you get older. The secret to looking younger than your age is to use a high quality moisturiser daily in combination with the complete facial skin care routine products. our skin healing and anti-aging, facial care products - pure and natural. Flawless skin is now a reality even if you have spots, blemishes, acne and more. It's all about finding the perfect fit and our VOLCANIC EARTH Barber Skin Care Range with Tamanu Oil delivers results no matter your skin type. Whether you have dry, oily or very sensitive skin, with our Cleanser & Shave Foam, Aftershave Splash, Face Scrub, Face Mask and Face Moisturiser with Sunblock it is easy to keep your skin in a natural healthy condition.